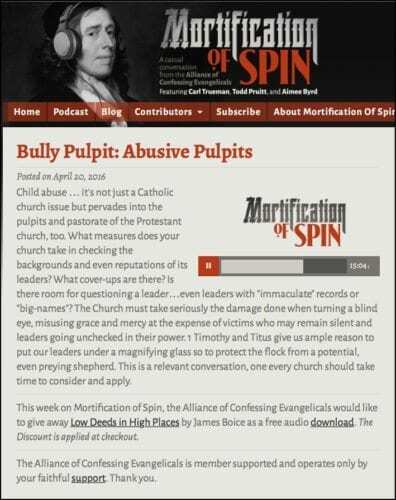 This latest Mortification of Spin podcast is outstanding. Though not mentioned by name, hosts Carl Trueman, Todd Pruitt and Aimee Byrd are clearly referring to C.J. Mahaney and the latest T4G Conference. I nearly yelled out a Bob Kauflin YES! while listening to this program! It is so gratifying to finally hear from Christian leaders who clearly understand the problem and boldly address it. Go to this link to hear the whole program. Finally heard the pod cast. So excellent!!!!!!! The Wartburg Watch also revealed under their Sept. 16, 2015 post entitled “Brother CJ Mahaney: He’s Done Gone and Joined the Southern Baptists!” that on the website SBC.net, which lists Southern Baptist churches, that Mahaney’s Sovereign Grace Church of Louisville is listed there. Not only that, but under the SBC minister search, CJ Mahaney is listed as a SOUTHERN BAPTIST MINISTER, as well as Mahaney’s brother-in-law Gary Ricucci and son-in-law Brian Chesemore. MAHANEY: And Decker says, speaking of Calvin’s sermons on Job, that that’s where his pastoral pulse is most pronounced. And these sermons are unedited, so that you will find that ‘pastoral pulse’ in those sermons in the Old Testament in a way you won’t find in the Institutes. So, if Mahaney doesn’t have any inner Southern Baptist, as he is seen seriously proclaiming in front of 10,000 people, then what is behind his close affiliation with them? And if there’s no “inner Southern Baptist” at work within Mahaney, then why is he a Southern Baptist Minister? Why is his church listed as a Southern Baptist Church? Why has his Pastor’s College “partnered with the SBC for the purposes of training and gospel mission”? What is that all about if Mahaney doesn’t carry “any inner Southern Baptist” within him? Perhaps it would be because Mahaney would say he’s just a humble™ man, concerned about the centrality of the gospel™, living the cross-centered™ life. Thanks for the comment, Paula. Also, so as not to put words in Janna’s mouth- I meant, “I suggest”- not I agree- that certain MINISTRIES be ignored. Ignoring comments is one thing, deciding I can no longer listen to whole ministries is obviously quite another. I am personally heartily disappointed at what I see as closing ranks against those not in leadership, and I can no longer listen to nor trust ministries like that. As I said, grieving this, and apologies for so many comments this time around. God bless! Intelligent and thoughtful comments are always welcome, Melody. I agree that you shouldn’t have to listen to ministries or people who annoy or upset you, if that’s what you’re saying. I’ve become much selective about the blogs and comments I read, and my life is better for it. And finally: if Todd P was not in fact referring to commenters at TWW in his tweet I came across, I do sincerely apologize to him for my assumption. Thank you to Todd Wulhelm for all you do. And I am very glad MOS did this podcast. Truth has authority. Thanks Janna. I think the whole go-privately-about-public-issues is a way to stifle dissent. I know that is the expectation among some in Todd’s circle but I am past taking the bait. I was shocked at Todd’s response at TWW where I felt discussion was going quite respectfully with valid points being made. I feel he needs a reality check of the impact of both Carl’s actions and now his defensiveness, and having seen his tweet about his view of watch blog commenters I do not trust him. TWW were, in fact, standing up for MOS there, and some of us-many Christians-simply want to know what Carl is going to do about how his involvement was used against victims and the many Christians involved who care. Thank you for letting me know there has been progress. That is encouraging to me. I grieve to know what victims’ families have gone through trying to get justice, when the response that honest questioning gets from Todd and those at Grace To You let alone TGC/T4G is so antagonistic, convoluted, and unteachable. I truly hope they start to understand the reason people are frustrated. The smearing of fellow believers who speak forthrightly has gone on long enough in evangelicalism. 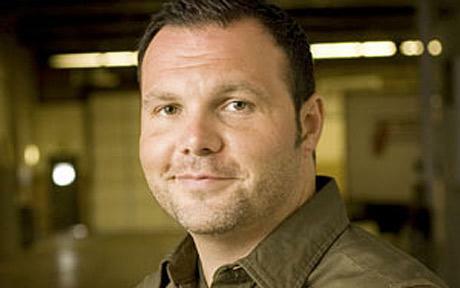 Ps I mean Todd Pruitt. Not Todd Wilhelm. To clarify. 😉 and I agree with what someone here said about bent nails. I am pretty sure there many have been misunderstanding. Todd Pruitt is the one who came on TWW accusing people of slander. I found that shockingly offensive, given the slander spread against bloggers who have been caring for much longer than he. Todd Wilhelm is one of them! I feel fine emailing that Todd privately. Not so much Todd Pruitt given his comments on Twitter about commenters at TWW. I found his apparent lack of pastoral concern for fair frustration and genuine hurt disheartening. Many apologies for not being clear and forgetting the last names involved!! Todd Wilhelm (the owner of this blog) and I have some catching up to do on the blog as well, as work on what we do for a living. So please give us a couple days to figure out what’s going on with the Mortification of Spin situation. Read your comment and figured out I was shoddy in my naming. So sorry. Also misspelled Todd Wilhelm above thanks to auto”correct”… Apologies for all and love to ALL concerned. No problem, Melody. One issue with the Mortification of Spin podcast appears to be that it’s very hard to figure out whom its creators are referring to, as they don’t provide the actual names of the folks they’re criticizing. That reflects on their communication skills, not yours and mine, Melody. One thing I will say about Todd Pruitt is that I have not carefully followed his comments on The Wartburg Watch blog or elsewhere because I was not impressed with his initial post(s) about kicking Mahaney off the Together for the Gospel Conference found here and here. I thought they were both written poorly and researched poorly. First Mr. Pruitt says that C.J. Mahaney should be banned from a major Evangelical conference because the allegations of covering up sexual abuse against him appear to be true. Then he switches course and says that for all Mr. Pruitt knows, Mr. Mahaney may be pure as the driven snow and simply the victim of malcontents and slanders. Flip-flopping to that degree is neither helpful nor honest, in my opinion. 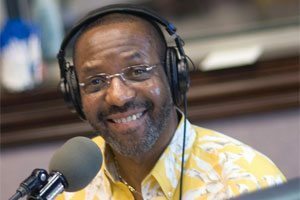 If for no other reason than that he is close friends with Mr. Trueman, a Pastor who is still officially publicly declaring that C.J. Mahaney is fit for Ministry, Mr. Pruitt should have developed some idea about whether the allegations against Mahaney are backed up by facts or are merely gossip. I think that Mr. Pruitt can and should do more research into the sexual abuse scandal at Covenant Life Church and Sovereign Grace Ministries as opposed to continuing to make strong public statements about issues that, by his own contention, he knows little about. I’m also not sure why Mr. Pruitt is speaking for Mr. Trueman, if that is the case. I say “if” because I haven’t fully researched this matter myself yet. If Mr. Trueman feels that he’s being slandered on The Wartburg Watch or any other blog, he should say so himself instead of hiding behind a friend, in my opinion. In response to your other comment about ignoring some- there are several I am now ignoring for the future. I agree the statements Todd P made, as you describe, were problematic. The reason I am angry is that I expected better from many people, and this is the nail in the coffin of a sector of evangelicalism for me. The context of Todd Pruitt’s comments for me was Phil Johnson’s Facebook post which Todd P also praised. My comment on that is: https://spiritualsoundingboard.com/2016/04/14/phil-johnson-some-thoughts-on-cj-t4g-and-survivor-blogs/#comment-326518 and the whole FB post is in the blogpost. There is a narrative being spread in those circles that any who are angry at abuse in the church hate ministries like Grace to You and MOS or whatever because we don’t like how they have obfuscated this or that, and are leaving them and telling others why. In my opinion, the reality is that they are making themselves irrelevant by refusing to listen to the families who were abused, some of whom state that they interacted directly with CJ on http://www.sgmsurvivors.com/the-stories . There is no way anyone can speak truth into that blindness, and so I agree, those ministries should now be ignored. I am grieving this. I hope you’re well. Thanks for being patient with me in getting back to you. I did look at Todd Pruitt’s comments on TWW. I don’t wish to fan any flames as tensions did get high on the post you referred me to. However, I will say that I find there’s little point in trying to dialogue with someone who is constantly calling people that he or she disagrees with slanderers and malcontents. Relying on ad hominem attacks leaves no space for intelligent conversation, unfortunately. That being said, I am glad that the Mortification of Spin podcast came out as it has stimulated a lot of thoughtful debate. Just a couple thoughts. One, I’ll let Todd get back to you yet want to say that we appreciate your comments. I do think that you can e-mail Todd privately, but there’s no need to do so if you’re simply disagreeing with him about an issue which you have backed up by intelligent reasoning, per our comment guidelines. Which you have. It sounds as though the situation has changed, since Todd and I wrote our initial comments about Todd Pruitt’s and Carl Trueman’s podcast. Please give us a chance to re-evaluate our thoughts about the matter. Further to my further to comment: I do understand the desire to stand with a pastor, that motivated the initial stances. I do. I’ve sat with a pastor who was deeply wounded by church bullies. The issue here is that I’m still seeing truth tellers and thinkers attacked as unsubmissive to authority. But whose or what authority? I’ll be honest, church authority these days is more like papal stuff than biblical authority, precisely because these men are willing to listen to other men and pastors than treat all members of the Body equally under the authority of the Word of God. Even the “good” ones are guilty of this. Until that imbalance is corrected and pastors have a humility and gentleness towards those who oppose, realizing it’s not about them, I don’t think we can be sure women and children are safe from abuse. I’m very tired of being labeled unsubmissive, ungodly, unbiblical, or even egalitarian for saying that. Those are blinders that need to come off among the Reformed men. I’m still waiting to see some humility among these. A good podcast and speaking some truth is not enough. I’m glad for it, but nothing has changed in several hearts towards the hurting. I’m going to update agreeing with Janna again. Not sure if anything has changed over the weekend, but I have watched things go down on Twitter and the Wartburg Watch that disturb me. I will say this here, because Todd is not striking me as a person I feel safe to email privately. He came on TWW blistering about slander (and I saw no willful attempt to smear anyone, simply some concerned questioning) when legitimate critique of his friend was at issue. He needed a hard reality check of how much hurt has been caused but instead of being gentle and listening he decided to be harsh. If that is how he responds to criticism, his tweet about people who hate Biblical authority tells me a lot. Cynically, it looks like MOS wanted to get on the right side of this, but they don’t see anything wrong with immature pastoring. That means this will just happen in their circles again and again. Until certain men are mature and humble towards fellow Christians, instead of assuming we reject authority because we don’t respect their actions on something, this culture of lording it over isn’t going to change. It struck me this weekend that Phil Johnson loves vs 19 of 1 Timothy 5. I would challenge him to read in context, because this whole mess is about the serious sin of partiality. 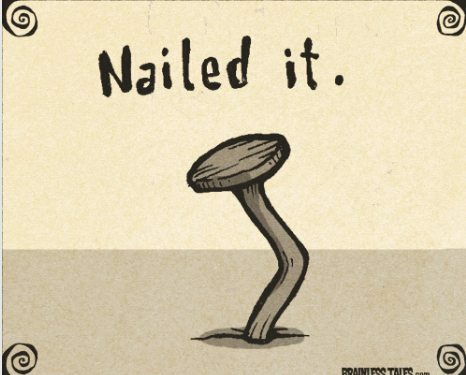 At first I thought the “nailed it” graphic used for this post was a flawed but on further contemplation it appears to sum up for me the pod cast. To clarify the nail doesn’t get bent if you hit it squarely with the hammer. As someone who pounded thousands of nails while growing up, my father was a builder, I can speak with authority on the subject of pounding nails. With Carl Trueman’s silence about his former position and Todd Pruitt imperious accusations of slander on TWW, I see their new position as a glancing blow. It is a small step requiring more work. Unfortunately a nail once bent will not be driven in, it will not hold. Had the same thoughts about Carl Trueman myself. He and the other two basically exonerated Mahaney of wrongdoing by asserting his biblical qualifications to remain a pastor. Is he changing his opinion now? If so, might be useful if he actually came out and said so and admitted he was wrong before. On the other hand if this is the same opinion he always had then that whitewash statement needs some explaining. Something still doesn’t quite add up for me. At least someone’s stating the obvious, finally. Would be helpful if they actually come out and say it instead of dancing around like Apollo Creed around Rocky Balboa. Would it kill them to say this is about Mahaney or whoever else? I would definitely say Carl Trueman has changed his opinion of CJ Mahaney. He made mention of the friends he no longer has, and I couldn’t help but think Mahaney is one of them. I like Carl Trueman, and he has a fortunate last name. CJ Mahaney got himself in to this mess, and it’s up to CJ Mahaney to either clean up the mess he’s left behind, or really retire from the pastorate – and this time without the flaming fanfare and the broadway-styled show! I’m not sure I agree with you on this one, my friend. 😉 Many people, including Carl Trueman, have unapologetically enabled C.J. 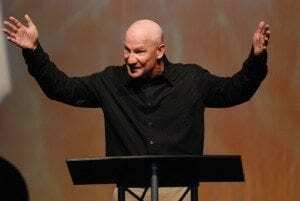 Mahaney to abuse others and mis-use his position as a Christian leader generally. Therefore, until Carl Trueman seriously acknowledges and apologizes for his role in covering for an obviously corrupt celebrity preacher, he has no business criticizing C.J. Mahaney or anyone else in Mahaney’s camp, in my opinion. Great points here. With respect to culture of the Brit in the mix, having grown up in his home country and knowing their politesse, is it however true he found nothing wrong with CJ back in the day? I commented about this on TWW but haven’t had a chance to check back and see if Carl Trueman’s has backtracked that verdict. Will he be willing to retract that analysis in light of the families’ testimony regarding CJ that we are aware of now? It seems to me the evangelical enabling is something we all would do well of repenting of, though some are clearly further along in repenting of that than others. What if we all just got real and named names? Not to shame but to warn and heal? Oops some poor wording and typos there. Rereading that I had another thought. I am not overly Reformed and ok with that as well as with my many Reformed friends. I think the point is missed slightly when it is made about a rigid theological stance within evangelicalism/Protestantism. Isn’t it quite simply that this is profaning the name of Christ? The SGM scandal is a disgrace to God’s church. Regardless of to what theology a Christian adheres, I have to say more people will definitely avoid evangelicalism over this, considering it a cult, and perhaps fairly so. I cannot refer to myself as evangelical anymore because of the total depravity evident within evangelicalism lately. I do know in whom I have believed however, and He is more concerned with His people loving one another than their being Reformed or not, I would suggest. In my understanding of Scripture, whatever lens we use, the issue here is the total lack of love that a large clique of quite nasty narcissistic evangelicals have shown whole families within the church of God. It’s serious sin, speaking as a Reformed theologian or not. Good points Melody. And I do wish Trueman would address his statement from the committee of 3 which found Mahaney had not committed any grievous sin which would disqualify him from ministry. After all, if you believe this podcast was aimed at Mahaney and T4G, which I do, he basically stated he is disqualified. He does not have a good reputation with those outside the church, nor inside! So did that statement exonerating Mahaney just go down the memory hole? In my book Trueman needs to repudiate his former position or at least address what has changed before he can have credibility to speak on this subject. Amen! I agree 100%, Bill. While I appreciate the podcast it rings hollow in Trueman’s case because he will not acknowledge that by sitting on Mahaney’s kangaroo court, which claimed that Mahaney was fit for Ministry, he’s essentially said the following. An egregious and blatant case of blackmail, which is detailed in the arguments Trueman presumably read claiming that Mahaney was not fit for Ministry and which have nothing to do with the allegations of covering up sexual abuse against him, does not preclude being a Christian leader. Carl Trueman is certainly not the first person to be fooled by C.J. Mahaney! So why can’t Trueman make a simple statement like the one above clearly repudiating his support for Mahaney? If he’s unable to directly admit he made a mistake, because that would embarrass him, that calls Trueman’s credibility as a Christian leader into question, in my opinion. And this saddens me because I think he has a lot to offer. Thanks for the comment, Bill. No seriously, I think one of the biggest problems in evangelicalism is this tippy-toeing around serious issues. Niceness is not kindness, any more than lambasting people is going to get them to change their ways. I agree 100%, Melody. I do appreciate what the Mortification of Spin guys are saying, fundamentally. However, they’re also sending some very mixed messages on different levels, as you and others have pointed out. And this isn’t a time in which the Church needs leaders who are sending out wishy-washy messages. I have respect for the gentlemen in question and hope they’ll take the fact that some people are confused by the message in their most recent podcast, into consideration, should they comment on the subjects it was about in the future. I said an emphatic “yes!” three times while listening. Yes, they nailed it! Hope lots of people get to hear it….especially those who need to hear it the most. Totally! I agree. And I’m guessing this got a lot of air play. It certainly preaches. Maybe CJ will base his sermon on it this coming Sunday haha. I’m sure Mahaney is fuming mad about this. Hey Buddy!, I found this information for you: "Mortification of Spin Hits a Homerun!". Here is the website link: https://thouarttheman.org/2016/04/20/mortification-spin-hits-homerun/. Thank you.